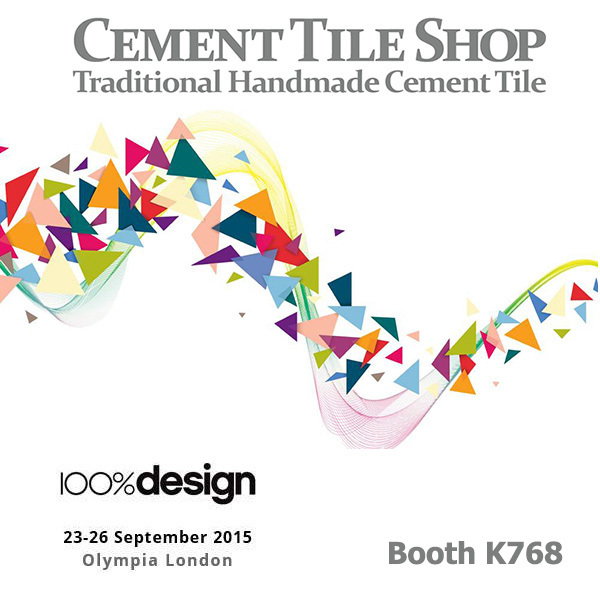 Cement Tile Shop is excited to have a booth (K768) at 100% Design 2015 in London this week. 100% Design is the UK’s largest design trade event, attracting architects, specifiers and designers from across the globe. The show will be held at Olympia London, September 23-26. Cement Tile Shop will be displaying and featuring our large quantity of European stock tiles, warehoused in the UK. Our handcrafted cement tiles are available for immediate shipment throughout Europe. Orders ship within 24 hours and can reach most points in Europe within a few days. Please stop by and introduce yourself to our European staff. We look forward to meeting you and discussing how we can incorporate our premier cement tiles into your current and future projects. Custom patterns and colors are also available. Please contact us here in the US at (800) 704-2701 or in Europe at +44 (0) 1527 892885 via phone, or email europeservice@cementtileshop.com for more information or to request samples.